The very bright star Alnitak (Zeta Orionis, the eastern-most star in Orion's belt) to the lower left of the frame, excites the hot gases in NGC 2024 (Flame Nebula) causing it to glow in almost unique and beautiful colours, predominantly shell-pink, but ranging from yellow to deep orange. 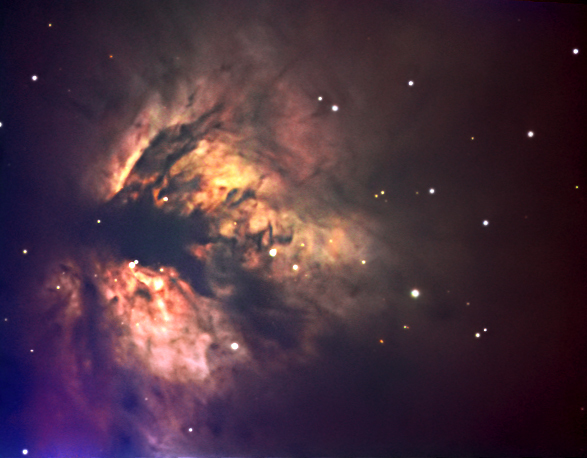 The dark central area is caused by a lane of dust in the foreground. The Flame Nebula is one of the most striking nebulas in the sky, although it requires dark skies and at least a 10" scope to appreciate its beauty.